Smart Group are an All trades Building company committed to sustainable building solutions for your home or business. We have the reputation, experience and accreditations to place us as one of Scotland’s top home build and energy improvements companies. We are experts in energy efficiency, renewable electricity and heat generation and we are committed to delivering great quality, value and service to our customers. Smart Group is a “Which?” Trusted Trader, and is accredited with many professional trade associations including Trading Standards, NFRC, RECC, and MCS. Combining these standards of quality with over 30 years of experience in the building industry, and by providing leading warranties of up to 10 years, we offer our clients total peace of mind. We are government approved installers of renewable energy products, and we only supply top quality products from major manufacturers fitted to precision at affordable prices. Every step of the way, we’ll explain all of the options available to you, and give you time to feel confident about making the right choices. We have built our reputation over years of honest advice and expert service for our customers. At Smart Group, we don’t believe in trying to sell our clients a product, instead we diagnose a property’s issues using sound building science, and recommend solutions tailored to the unique needs of your home and your budget. Feel free to contact us for an informal chat about any of our products or services. A solar panel installation contractor will be able to install home solar panels that will produce energy to power either your electricity (solar PV) or your hot water (solar water heating system). After the installation costs, you won’t need to pay for the energy you use as you are, in effect, producing it yourself. And even better, if you produce more energy than you need and feed it back to the national grid, then you could receive money from the government’s Feed-In Tariffs (FITs). What’s more, solar energy is a renewable energy that will last longer and be more environmentally friendly than traditional energies such as coal, oil and gas. All the more reason to talk to Glasgow, Glasgow City solar panel companies and hire Glasgow, Glasgow City solar panel installers to fit them for you. There are three main types of solar panel PV (photovoltaic) panels that can generate electricity for your home: monocrystalline, polycrystalline and hybrid. The basic monocrystalline celled panels are fairly efficient but will be more expensive than polycrystalline, which are a little cheaper. Hybrid panels use crystalline cells with a thin layer of film which attracts more energy. This makes hybrid models the most efficient solar panel installations, but also the most expensive. To talk about which panels are best for your home and how much energy solar panels produce, contact Glasgow, Glasgow City solar panel companies and installers on Houzz. 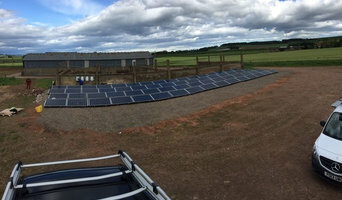 If you want a solar panel installation designed for your new house or renovation then you can discuss bespoke plans with Glasgow, Glasgow City renewable energy installers, but you may also want to involve other contractors, builders, roofers and specialists whose work could overlap. Here are some related professionals and vendors to complement the work of solar energy installation: Lighting, Swimming Pools & Hot Tubs, Electricians. Find solar panel installers on Houzz. Search the Professionals section for Glasgow, Glasgow City solar panel companies and solar panel installers or browse Glasgow, Glasgow City photos of completed solar panel installations and look for the solar energy contractor’s contact information.